L. Song Richardson is the Dean and Chancellor’s Professor of Law at the University of California, Irvine School of Law with joint appointments in the Department of Criminology, Law and Society and in the Department of Asian American Studies. She received her AB from Harvard College and her JD from Yale Law School. Her interdisciplinary research uses lessons from cognitive and social psychology to study decision-making and judgment in a variety of contexts. Her scholarship has been published by law journals at Harvard, Yale, Cornell, Duke and Northwestern, among others. Her article, “Police Efficiency and the Fourth Amendment” was selected as a “Must Read” by the National Association of Criminal Defense Attorneys. Her co-edited book, The Constitution and the Future of Criminal Justice in America, was published by Cambridge University Press in 2013. She is a co-editor of Criminal Procedure, Cases and Materials published by West Academic Publishing. Currently, she is working on a book that examines the history of race in the U.S. and its implications for law and policy. Dean Richardson’s legal career has included partnership at a boutique criminal law firm and work as a state and federal public defender in Seattle, Washington. She was also an Assistant Counsel at the NAACP Legal Defense and Educational Fund, Inc. Immediately upon graduation from law school, Dean Richardson was a Skadden Arps Public Interest Fellow with the National Immigration Law Center in Los Angeles and the Legal Aid Society’s Immigration Unit in Brooklyn, NY. A leading expert on implicit racial and gender bias, Richardson is frequently invited to speak to law firms, district attorney and public defender offices, police departments, universities, judges, bar associations, and private industry across the nation about the science of implicit bias and its influence on decisions, perceptions, and judgments. She also presents her work at academic symposia and non-academic legal conferences. 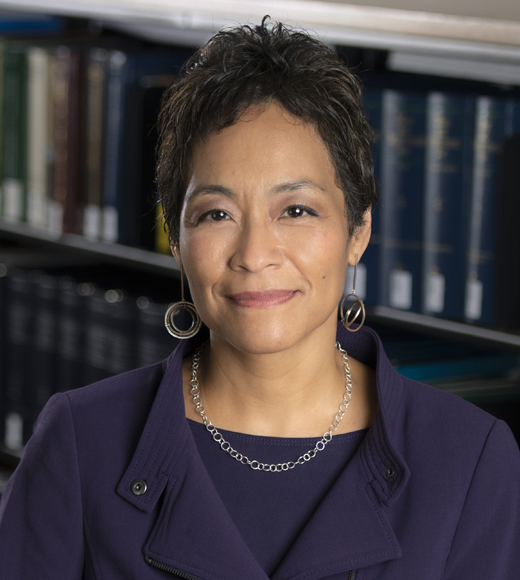 She has won numerous awards and recognitions, including the American Association of Law School’s Derrick Bell Award, which recognizes a faculty member’s extraordinary contributions to legal education through mentoring, teaching, and scholarship. She was recently named one of the Top Women Lawyers in California by The Daily Journal, one of the 100 Most Influential business and opinion shapers in Orange County, and one of the two most influential Korean Americans in OC. Dean Richardson is a member of the American Law Institute. She is also on the Executive Committee of the Association of American Law Schools, an association whose goal is to uphold and advance excellence in legal education, including promoting the core values of excellence in teaching and scholarship, academic freedom, and diversity while seeking to improve the legal profession, to foster justice, and to serve local, national and international communities. ﻿Devon W. Carbado & L. Song Richardson, The Black Police: Policing Our Own, 131 Harv. L. Rev. 1979 (2018). Catherine Fisk & L. Song Richardson, Police Unions, 85 Geo. Wash. L. Rev. 101 (f2017). L. Song Richardson & Rachel Godsil, Racial Anxiety, 102 Iowa L. Rev. 2235 (2017). L. Song Richardson, Systemic Triage: Implicit Racial Bias in the Criminal Courtroom, 126 Yale L.J. 862 (2017). Tonja Jacobi, L. Song Richardson & Gregory Barr, The Attrition of Rights under Parole, 87 S. Cal. L. Rev. 887 (2014). L. Song Richardson & Phillip Atiba Goff, Implicit Racial Bias in Public Defender Triage, 122 Yale L.J. 100 (2013). L. Song Richardson & Phillip Atiba Goff, Self-Defense and the Suspicion Heuristic, 98 Iowa L. Rev. 293 (2012). L. Song Richardson, Police Efficiency and the Fourth Amendment, 87 Ind. L.J. 1143 (2012).